Coffee grounds, an invasive tree called Casuarina, biodiesel byproducts, and gourmet mushrooms -- How are these four, seemingly disparate items related? 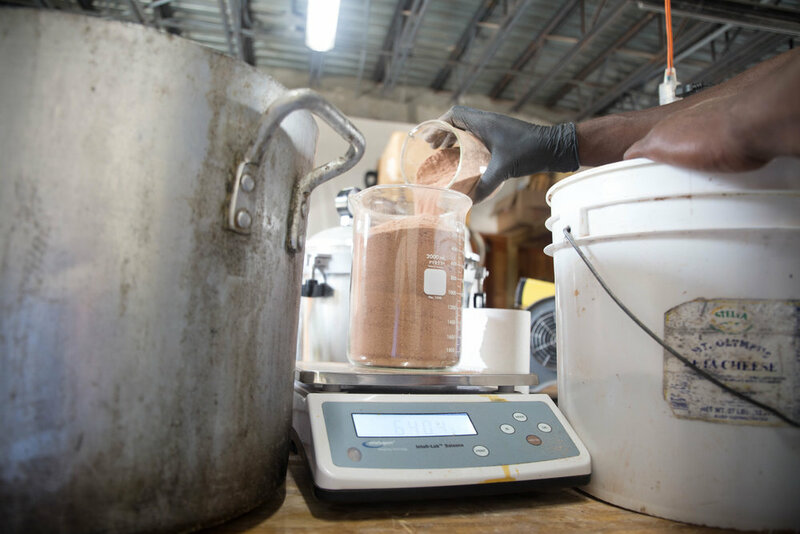 As part of the Center for Sustainable Development’s 2019 mycoremediation initiative, spent coffee grounds, sawdust, glycerol, and mycelium* are being used to help close the loop of waste produced at The Island School, while simultaneously increasing food security. Building off of glycerol waste and mycoremediation research by intern Kelly Rhodes (summer ‘18), CSD’s Energy Team is implementing systems that use fungal networks to reverse and stop environmental damage on campus. Specifically, mycoremediation will provide a sustainable waste management system for petroleum residues and glycerol that is produced as a byproduct of the biodiesel synthesized on campus. Fungi are unique in their ability to break down various contaminants, such as pesticides and petroleum products, via the secretion of extracellular enzymes. They detoxify and convert these contaminants into sugars to be absorbed by themselves and other decomposers. Without fungi, nutrients are unable to be recycled into soils that foster healthy ecosystems. Currently, experimentation being carried out by the Energy Team will demonstrate the fungi’s ability to adapt, and then utilize soil pollutants to thrive and propagate. In order to optimize the mycoremediation results, the team is testing which contaminants (crude glycerol, biodiesel, and motor oil) the fungal species, Pleurotus ostreatus (Oyster mushroom), is most efficient at digesting, and which substrates (coffee grounds, Casuarina wood shavings and sawdust) allow its mycelium to thrive. Once it has been determined which strains are most successful in various environments, substrates will be inoculated with the adapted mycelium and encouraged to propagate. The hope being that glycerol can be utilized as a food source for fungi, which will, in turn, remediate polluted soils and create nutrient rich environments to recruit healthy soil bacteria and native flora and fauna. Moving forward, this research will be continued as a Spring 2019 Island School research course where students will help analyze and monitor soil health around campus. A secondary component of the students’ work will be designing a mushroom farm, which will grow Oyster, Shiitake, and Lion’s Mane mushrooms -- all edible gourmet varieties -- for community consumption. The vision is to set-up and expand sustainable intensive cultivation methods, such that weekly harvests can be supported. This aspect of mycology addresses the project’s, and CSD’s overall mission to increase food security. Mushrooms can be grown on minimal inputs, such as coffee grounds, seaweeds, and sawdust. As such, they’ll serve as a way to close the loop on organic waste produced on campus, and as a benefit, provide a more diversified and nutrient-dense vegan protein source. Overall, we seek to prove the possibility of producing a more sustainable, and locally-sourced alternative to soy-based options currently offered. Aquaponics Update: New Nursery and Brood-stock System! Here at aquaponics, we have been getting ready for an exciting new upgrade. We are building a new nursery and brood-stock system so that we can separate our breeding program from our aquaponics system. To give a little background, our aquaponics system is a fully integrated system: the nursery and the rest of our aquaponics system are connected into one single recirculating system. We use tilapia in our system because they are a resilient species of fish. One of our main goals for our aquaponics system is to increase our food security and by rearing the tilapia throughout all of the developmental stages instead of importing the fish, we further reduce our dependency on outside resources. Reducing our dependence on outside resources takes us one step closer to our ultimate goal of using our aquaponics system to increase the food security on campus. The new design will separate the brood-stock and nursery from the main aquaponics system. The design incorporates another bio-media bed which is an essential part of an aquaponics system. The ammonia that the fish release in their feces is toxic to them, the bio-media beds filter out the ammonia as the water flows through the tanks. They contain two different types of important bacteria, one that converts the ammonia from fish waste to nitrite and a second that converts the nitrite to nitrate. Nitrates are important nutrients for the lettuce growth. Our research class has been helping every step of the way as we build the frames for our new system, complete calculations for the flow rates through the system and will continue to help us as the process continues. Their research project is focused on learning about maintaining an aquaponics system and analyzing how the new separate systems compare to the fully integrated system we currently have in place. We are separating our main system for a variety of reasons. While tilapia is a resilient type of fish but one of the most important variables for more efficient growth rates and breeding is the temperature of the water, specifically in the breeding and nursery stages. The ideal temperature for the nursery and breeding system is 28℃ and in our current system the temperature is highly variable. Essentially the system will allow us to have more control over the breeding and nursery system which is important for the lifecycle of our fish, the more tilapia we are able to include in our system. As our tilapia output increases we are able to move towards our goal of increasing food security on campus. Michael, one of our general systems interns and two participants work to install the solar modules along the roof. Earlier this month we announced that CEIS was granted an annual business license to practice the business of solar design and installation throughout the Bahamas. We are the only approved Bahamian solar engineering, procurement and construction firm on Eleuthera and proud of it! One of our values as an organization is to center our business on our local and global community and environment. With that in mind, we developed the certificate training program in collaboration with the Center for Training and Innovation (CTI) which was approved by the Ministry of Education, to accompany the new permission. The certification program will benefit Bahamian locals as they will gain technical and practical skills throughout the program. Last week, seven participants completed a practical week-long training program which certifies them in solar installation. Bryan, one of our sustainability teachers who specializes in renewable energy, designed the curriculum and taught the course. During the first half of the week the participants spent time in the classroom learning how to evaluate a potential solar site, the basics of solar design and site construction. Friday, the participants completed the last part of the course which required them to apply the practical skills they learned in the classroom to a physical solar installation at CTI and pass a written exam. The CSD solar interns, Bryan, and the participants worked together to install solar racking, optimizers, solar modules, and the solar inverter on the roof of a cistern. Everyone was incredibly enthusiastic throughout the training. One participant expressed how he appreciated learning about DC electricity because his past knowledge corresponded with AC electricity. This training program sets the standard for solar installers throughout the country and these participants should now feel comfortable soliciting solar energy work. The program should increase adoption of solar energy through the islands as the solar workforce has effectively increased. Overall, the course was a great success for everyone involved. Prior to this course the participants already had a baseline of building and electrical skills. 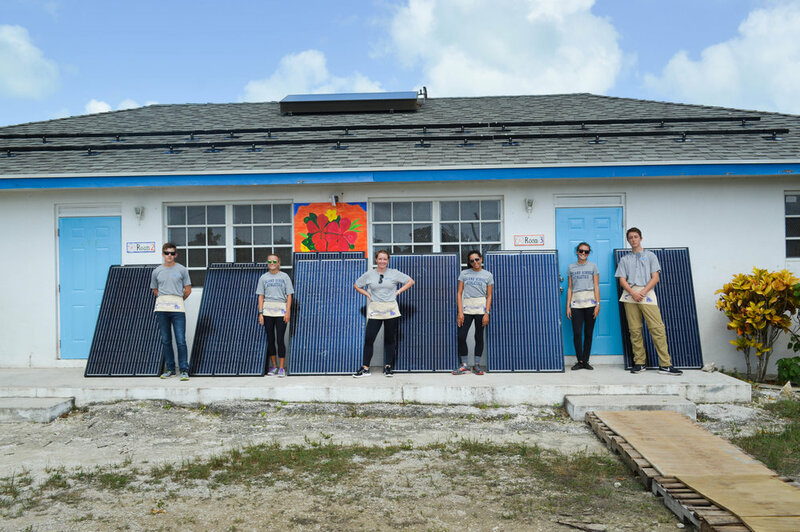 Yet, one of the many benefits of the training program is the acquiring of new and necessary skills to safely install solar energy systems in the Bahamas. The course allows us to work towards our goal of implementing the systems that we use on campus to decrease our impact on the environment, to the wider Bahamian community. Bryan on the right and the participants after they completed the training program. The year 2018 has been a year of firsts on the Cape Eleuthera Island School campus. With all the accolades that have come the school’s way for its marine science efforts over the past 18 years, there has always been another, albeit less publicized, but consistent thread throughout the CEIS fabric. With 70 kW (power) of installed renewable energy (RE) generating equipment on campus, providing about 40% of the energy (kWh) necessary to light our classrooms, cool our offices, and heat our water; the wind turbine and solar modules on campus were some of the earliest RE systems in The Bahamas and surely the only ones to be given special permission to connect to the electrical utility grid on Eleuthera a decade ago. With that history in mind, CEIS received a new endorsement this year on their business license. In addition to non-profit educational institution, CEIS is now granted permission to do solar design and installation throughout the island nation. CEIS moved quickly in this new space, and successfully installed and grid-connected the first commercial solar array on Eleuthera at The Cape Eleuthera Resort and Marina next door. This array received the new distinction of the first Small Scale Renewable Generation (SSRG) approved array on the island. Now...with that history in mind, CEIS recently developed a solar training program for island residents to skill the future workforce for the renewable energy industry on island. To further legitimize this training, the curriculum was sent to the National Accreditation & Equivalency Council Of The Bahamas (NAECOB) for approval as a new certificate-based training program. In yet another first for CEIS, the course was approved. Beginning September 3, Introduction To Solar-Electric Theory, Design, and Construction: A Practical Approach To Designing and Installing Residential Scale Solar-Electric Systems in The Bahamas, will be delivered to the inaugural 15-student class as a 40-hour solar installer certificate program in lockstep with our friends in this venture CTI - Centre for Training & Innovation, in Rock Sound. As part of this first-of-its-kind training, participants will receive trade-specific tools, textbooks, complete an examination, and also take part in a practical 8-kW residential-scale solar installation. This training was made possible through the collective efforts of CTI and CSD, who entered into an agreement to collaborate in the training of solar professionals on the island of Eleuthera. Funding provided by United Nations Caribbean Environment Programme's grant funding program, Global Environment Facility (GEF). For more information about GEF, visit their website. As always, we believe there is no better way to learn than to do. Class details can be found on the Center for Sustainable Development's Facebook page. CSD pursues new project to convert glycerol waste. Two small, unassuming boxes sit under the window in the small kitchen at the back of the Center for Sustainable Development. Small and cardboard they could easily be dismissed-- but in actuality these boxes are the important first step to a unique ecological project driven by CSD intern Kelly Rhodes. Inside the boxes are mushroom spores. The intention is for these mushrooms to inoculate in the boxes so they can eventually convert glycerol waste into a useful resource. This process is called mycoremediation, and it is an exciting opportunity to rethink the impacts of waste on our own campus. As fossil fuels and waste continue to degrade our environment, scientists are experimenting with creative, alternative methods of turning waste into resources. CSD employees and interns are excited to join these efforts! Kelly collects samples of soil and wood chips for preliminary testing of the glycerol and pH levels in the soil. This project is an extension of another CSD venture that uses left over cooking oil from cruise ships to make biodiesel. At the end of the biodiesel process there is leftover glycerol waste which was previously stored on campus. This new project, however, is finding a way to turn that waste into useable soil! There are many environmental benefits to this project including reducing the amount of waste on campus, decreasing the amount of soil that needs to be shipped in and removing the invasive Casuarina tree, which is used to help grow the mushrooms and produce the soil. The soil and woodchips are mixed with a pH indicator capsule and water to measure the glycerol content in the soil. 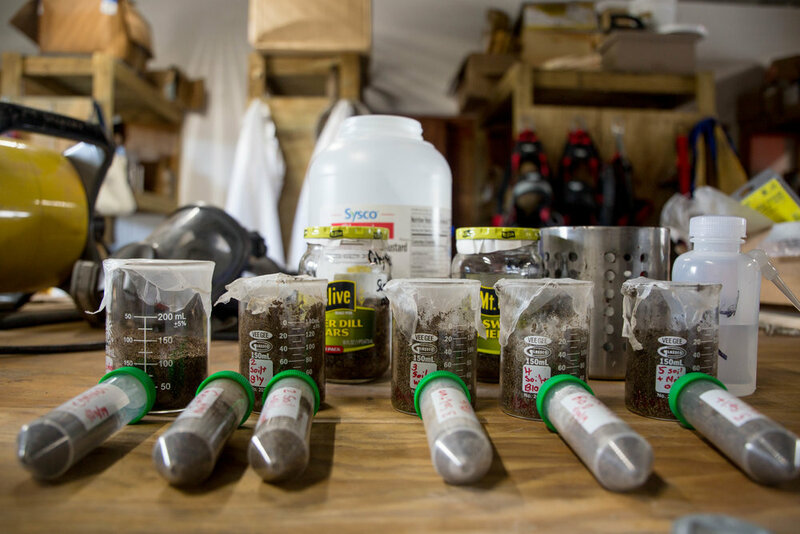 If the pH numbers increase throughout the process -- meaning the soil becomes less acidic -- it will demonstrate that the mushrooms are successfully converting the glycerol into usable soil. Nitrogen and carbon levels will also be tested. This project is just getting started but we are already so excited to see how it grows! In the future, Kelly will continue improving upon this project as her senior capstone project and interns and staff at CSD will continue to test the health of the soil. They hope to eventually increase the size of the grow beds and subsequently increase the amount of glycerol used in order to make more soil that can be used on the campus! Permaculture: A Farewell from the Permacults! The Permaculture Team’s Parents Weekend meal was a huge success! To recap, the menu included appetizers such as tilapia and coconut meat. For the main meal, the parents were served grilled pork; the pig was raised and harvested here at The Island School. We also served local steamed cabbage, mashed pumpkin & sweet potato, bean roll ups, collards, and banana bread for the main entrée. The beverages included locally sourced coconut water with mint, hibiscus and lemongrass. Our local meal traveled about 205 miles total with the food being from our own campus, Eleutheran settlements including Deep Creek, Rock Sound, Tarpum Bay, Palmetto Point, and Andros, another island of The Bahamas. We were proud of this mileage when comparing it to the average American meal, which travels around 1,500 miles. After saying goodbye to the families, the Permaculture Team began working on a scientific poster in preparation for the educational and research exhibition. In class, they read current event articles relating to food and agriculture. A few recommended articles by the Permaculture Team, if your interested, include “5 Food Apps That Make It Easy To Eat Sustainably,” which talks about eating sustainably by using apps that will help you find the right food with minimal effort. Another article is “Food That Travels Well” from the New York Times. It talks about the term “food miles” (how far food has traveled before you buy it) and people having different views on whether imported food is better or worse than locally sourced food. The team cannot believe how fast this semester has gone by and is sad to leave their Permaculture family as they have all become so close. When asked about their favorite part of the semester, they all agreed it was visiting the different farms (Joseph's, Rodney’s and Island Farm). They were intrigued by the different types of farming, especially Joseph's which looked so different from what they have always imagined farms to be. Joseph also gave each student the “best banana in the world,” which may have swayed their opinions! The Permaculture team truly valued their time learning alongside their co-advisors, Joe Plant and Leigh Schmitt, and being an equal part of the research process. 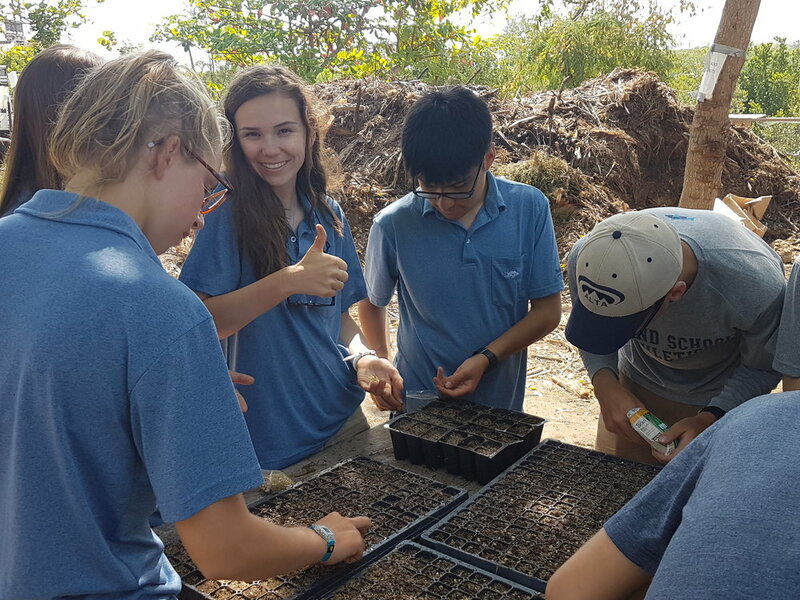 Although the Spring 2018 Permaculture Team’s time at The Island School is coming to an end, they hope future Island School students continue to research permaculture and sustainable farming. Some of the ideas the Permaculture Team has for further research include: expanding the school’s animal husbandry with goats or cows, increasing crop diversity and rotation, and increasing outreach by possibly going to schools in Eleuthera and talking to other students about sustainable farming issues. Moving forward, members of the Permaculture cohort will bring their learnings and assign them to their daily lives back home. Each member thinks they will be more aware of their food and promises to try to research where the food on their plate is coming from, as they each now feel a greater responsibility to eat as sustainably as possible. They all hope to educate and influence the people in their lives to do the same when grocery shopping and ordering at a restaurant. The Center for Sustainable Development is excited to announce that it has recently received some global recognition! 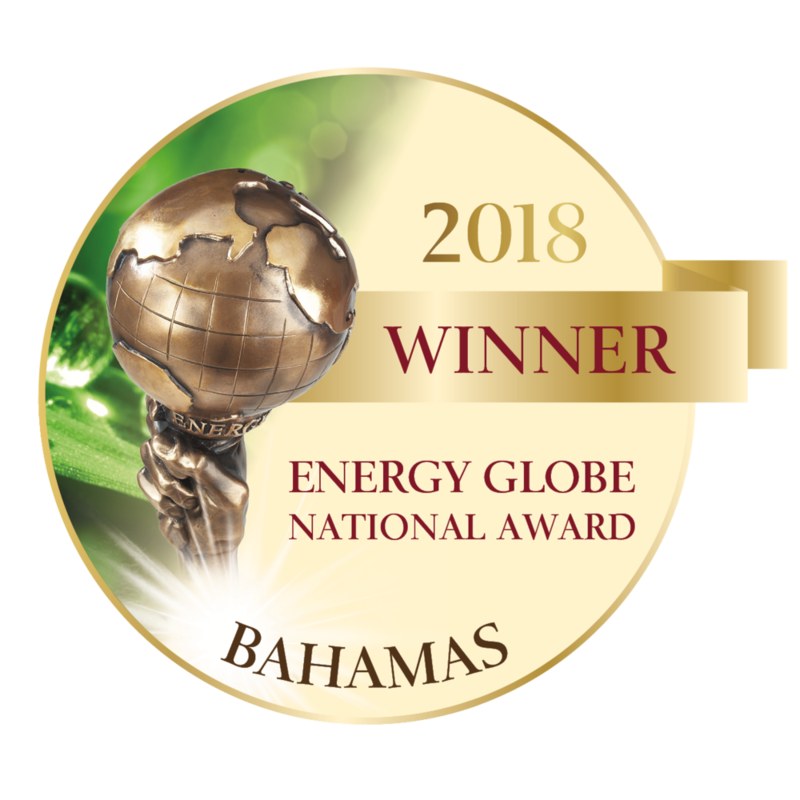 The Plastic-to-Fuel via Pyrolysis Project has been awarded the 2018 National Energy Globe Award for the best project in The Bahamas! Our team is excited to receive this honor and showcase our work for a larger audience. The Energy Globe Award is one of today’s most prestigious environmental awards that is granted to cutting edge sustainability projects across the globe; thousands of projects are submitted to this competition each year. The goal of the award is to present successful sustainable projects to a broad audience, and highlight feasible solutions to environmental problems. Our project is now a contender for the Energy Globe World Award, which will be announced later this year. Project lead Alex Perkins making a batch of fuel. CSD’s Plastic-to-Fuel via Pyrolysis Project has seen tremendous growth since its inception two years ago. In this time it has iterated through numerous prototypes, scaled up to a campus-scale working model, collaborated with experts, universities, and engineers around the world and undergone simulations and laboratory testing. Recent results from a Dartmouth College study have shown that the fuel produced from our system is comparable to diesel fuel and that the system is energy positive, meaning we get out more energy than we put in. CSD hopes to continue to develop the system to to make it more efficient and profitable. For more details on the project and the Energy Globe, see their announcement here. After three weeks of expeditions, the Permaculture Research Team is finally all back together and busy preparing for Parents Weekend, which begins this week. As a part of the Permaculture Team’s Parents Weekend presentation, the group has planned a meal of all locally sourced food. In addition to serving our growing vegetables, the meal will also feature meat from animals raised on The Island School farm. As animals hold a vital role in agricultural systems, it was deemed necessary that the Permaculture Team should have the unique experience of being a part of the harvesting process of tilapia, ducks and a pig. The Island School’s permaculture technique is called “stacking functions,” which means the animals raised on the farm have more functions than just being consumed in the dining hall. The tilapia are used in the aquaponics system to fertilize the water in which we grow an abundance of vegetables including lettuce, herbs, and tomatoes. The ducks, chickens and pigs help fertilize the soil and facilitate a crop rotation. Once the animals are reaching the end of their life span they are used to feed The Island School community. First, the Permaculture Team headed over to the aquaponics system for the tilapia harvest. 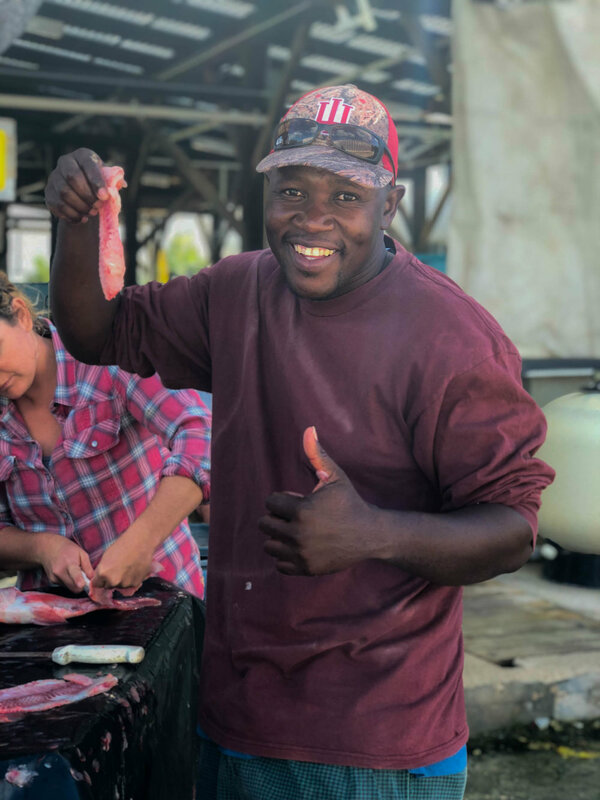 The team learned that the process begins by putting the tilapia in buckets of ice water which reduces their metabolic rate to a point where they are humanely culled and the filleting can begin. The harvested tilapia range in age from 9-15 months and weigh an average of 1300 grams. The research team dissected the fish with hopes of collecting around 25% body weight of each fish. With the help of other community members the team filleted a total of ninety tilapia. The next harvest was the duck slaughter at the farm with the help of Walter, who raised the ducks. Walter taught the team that in order to place each duck in the least amount of stress he covers their eyes and and then with one motion he swiftly cuts the head off of the animal. The blood was then drained from the ducks by hanging the body upside down by the feet. Next, each duck was placed in very hot water in order to make plucking the feathers easier. The students who chose to help plucked and carved the ducks before sending them to the kitchen. The largest harvest was saved for last. Waking up slowly and wearily, the Permaculture team was joined by the rest of their Island School student peers to meet with Joe, Joseph and Johnny (from the farm team) at 6:15 AM to voluntarily partake in the pig slaughter. Before approaching the pig pen, Joe explained the process to the students on how the slaughter would take place. They then let the pig out of its pen and led it to the awaiting group of students, enticing it with a bucket of food. To ensure that the pig was relaxed, the farm team had practiced the same feeding method over the previous two weeks. Then, very carefully and precisely, Joseph shot the pig between his eyes with a captive bolt gun, ensuring to hit the brain and brainstem, which immediately killed the pig. Although certainly dead, for a minute or so the pig twitched and wiggled due to firing nerve endings. Next, similar to the ducks, the pig was placed in hot water and farm team and willing students proceeded to dehair the pig with knives and pig scrapers. Joseph sliced the pig open and gave a quick anatomy class of the pig’s internal organs. Soon thereafter, the students left for breakfast as the prepared pig was readied for transportation to the kitchen. These lessons really helped the students connect with their food and understand the process used to produce the meat they consume at home. After this past week, the students discussed how they felt about each practice and the ethics behind each slaughter. The consensus was that it is very important to know where the meat you consume comes from, and that you buy from farmers who exercise ethically sound practices. The Permaculture Team is excited to show their families everything they have learned over the past semester and to start cooking! The Permaculture Research Team has been busy over the past academic week in its progress towards Parents Weekend! 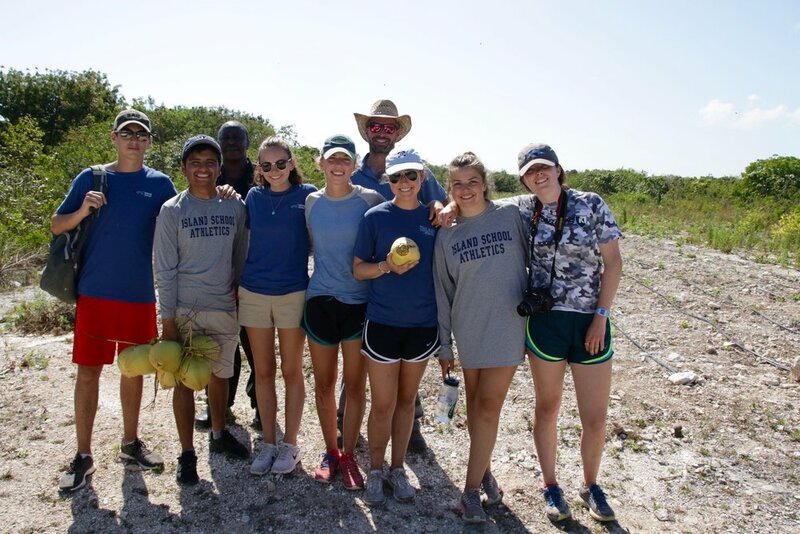 The team has continued collecting and comprehending data, visited a local farm in Palmetto Point, harvested a wealth of radishes from The Island School’s on-campus farm and has planned a locally sourced Parents Weekend meal. First, the students dropped by Island Farm, a local farm and food stand on Queen’s Highway in Palmetto Point, where they investigated another form of Bahamian farming. Island Farm is a hidden oasis west of Queen’s Highway, humbly advertised by a large, unassuming wooden sign. Ostensibly a simple farm stand, Island Farm is actually an extensive (roughly 15 acre) operation—the gross majority of its products fueling its storefront. The physical farm stand is populated by various value-added goods: jams, jellies, hot sauce, pesto, hummus and more. Behind the storefront lies the nursery plants (also for sale) as well as the agricultural fields. The sheer amount of greenery is pleasantly overwhelming and lush in comparison to previously visited farms. The Permaculture Team has really valued visiting a variety of farms over the semester as well as being able to compare the ways in which different agricultural systems create, maintain and irrigate their soil. In the case of Island Farm, more specifically, the students were able to see how other types of agricultural enterprises use compost as a major soil amendment to produce healthier and more productive soil. Island Farm is unique in that the business also operates on the income of several separate “side hustles” (like the farm stand products and a landscaping business branch) which provide a monetary cushion for the actual production of fresh produce. On the Permaculture Team’s farm on The Island School campus, the team has managed to pull 5.75 pounds of radishes from the raised beds. The second of three radish harvests for the 2018 growing season, this most recent harvest went straight from the campus farm to the kitchen, where it was quickly chopped and added as a delicious bonus to the salad bar for the community’s lunch. The third radish crop—which was planted during the first expeditionary rotations—will be ready for harvest just in time for the Parent’s weekend lunch in approximately two weeks. The Parents Weekend meal, one of the Permaculture Team’s original projected goals for the semester, is quickly approaching. In preparation for this locally sourced lunch, the students have been in discussion with Jacquel, the head chef at The Island School, regarding the coordination of this meal as well as the creation of its menu. In investigating the origin and distance of the various foods we seek to place on the Parents Weekend menu and conversing with Jacquel about her food-acquirement process, we gained a deeper understanding of the campus’ food shed. We hope that our lettuce, peppers, and cucumbers turn out as well as our radishes, and we can’t wait to serve our farm-to-table meal! Without bees, many food crops would fail. According to The Nature Conservancy, “the monetary value of honey bees alone as commercial pollinators in the United States is estimated at about $15 billion annually with them doing almost 80% of all crop pollination. Without them, farmers and consumers could potentially be at a great loss.” Therefore, if the Cape Eleuthera Island School wants to have a completely food sustainable campus, we NEED bees! There is a lot to know about beekeeping and making sure your bees have all the tools they need to live healthy and happy lives. If you choose to have your own hive at home, a hobby that is growing ever more accessible, make sure you do plenty of research beforehand. There are a number of websites to help get you started learning about bees and beekeeping if you choose to pick up this new hobby. However, having your own bee hives in your backyard is not the only way you can help support and grow the bee population. A great way to help the bees is by planting vegetation that will help them produce their honey. This is not only beneficial for the bees, but the bees will help the plants flourish which will make your garden look amazing. It’s a win-win! Bees are attracted to flowers and plants based on color, scent and appearance. If you are looking to start your own herb garden, planting lavender, catmint, sage, thyme, fennel, and chives are among the best for bees. Recently, The Island School’s Permaculture Team has been conducting research on food sourcing in South Eleuthera. From small, subsistence-based farms to convenience stores in the settlements, discovering the island’s food sources are of the utmost importance to this research team. Unearthing where local Bahamians get their food from, and how it got there, is critical to grasping the complexity of - and finding solutions to - local food insecurity. A foodshed is a holistic snapshot of all of the food sources in a given area. 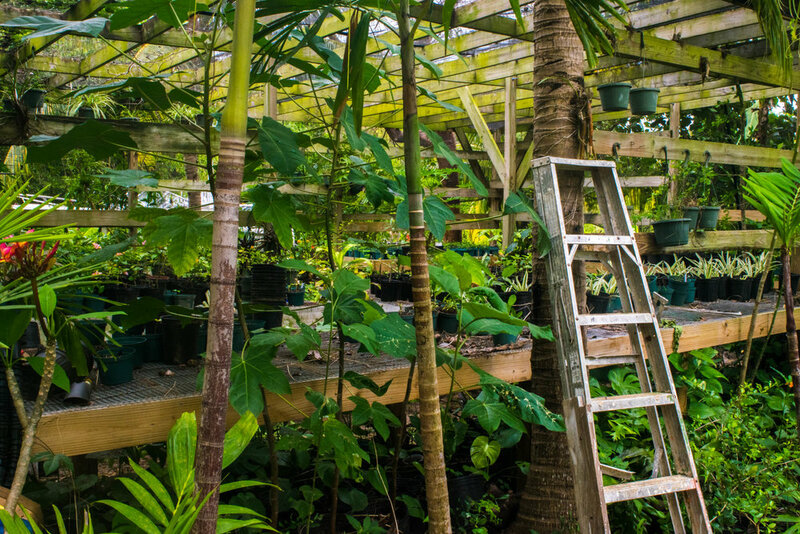 Learning about the Bahamian foodshed, and more specifically our Eleutheran foodshed, gives us context and teaches us how to live well in a place. Though we are privileged to have access to fruits and vegetables grown here on The Island School campus, many Bahamians only have access to packed, processed foods. Unlike in developed countries, there are not many grocery stores or bodegas to buy fresh foods at. Instead, many settlements have small convenience stores that sell only a handful of candies, snacks, and non-perishable canned goods. Bahamian cuisine has a rich culture and history, and culinary influences stem from places like West Africa and the southern United States. One of the more common meals on-island, however, is instant Ramen due to its convenience, cost, and long shelf life. Ramen has been called a staple food of the Bahamas. Dr. Allison Karpyn, a Fulbright scholar studying Eleuthera’s food security said, “I strongly suspect we have a Ramen epidemic on our hands, and healthy nations cannot be built on Ramen.” During one of our field trips, we got the chance to visit a local convenience store first-hand, and it was eye-opening to see the limited selection of fresh foods that they offer. As the Permaculture Team tries to tackle the problem of “a nation built on Ramen,” we have been visiting local farms. Last week, we visited two farms, both run by Island School staff. The first was a small farm, located on the outskirts of Deep Creek, run by CSD’s own Joseph Elidieu. He maintains a more subsistence-based farm and supplies fresh fruits and vegetables to both locals and Island School teachers. Joseph cuts down small plots on his farm and burns the foliage to create a layer of potash to be used as a fertilizer. Working during his free time to maintain it, Joseph runs the farm himself and the work is very labor-intensive. 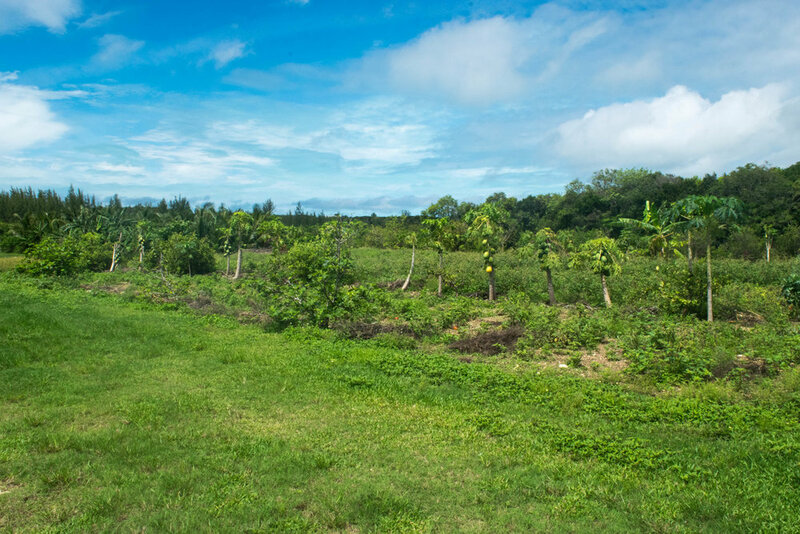 When we visited Joseph’s farm, we were able to see what he plants and even try some of his delectably sweet bananas! After leaving Joseph’s farm, we had the chance to visit a slightly larger and more traditional farm owned by Rodney, a cook in The Island School’s kitchen. Similar to Joseph, Rodney also runs his farm in his spare time, but it is considerably bigger and includes livestock, mixed vegetables, and a fruit nursery. His farm covers 25 acres, and much of it is under cultivation and irrigated extensively. From annual lettuces to perennial citrus trees, Rodney grows a little bit of everything on his family owned and operated farm which supplies local restaurants, as well as The Island School, with lots of their fresh produce and pork. Though Eleuthera used to be considered the “breadbasket of the Bahamas,” there are currently not many local farms on island due to changing economies and cultures around farming. By visiting a few of the farms that remain, we hope to spread the word on where our food is from and encourage people to keep this generations-old tradition alive. Join the Permaculture Team in the weeks ahead to stay updated on The Island Schools journey to food security! During academic week three, the Permaculture Research team focused their sights on plant science and botany. Our primary projects this week included: pruning the CSD orchard, making our own moringa biofertilizer, and becoming more familiar with subtropical botany and local plant identification. Here at The Island School, our campus is covered with a variety of native and naturalized plants and trees all serving unique purposes which we try to utilize as much as possible. An end goal of permaculture design and planning is to create an edible campus full of ecological functions. The Permaculture team worked on pruning many of the trees in the CSD orchard. We learned that in order to trim trees properly, one must prune branches that grow inward or cross one another so as to increase airflow and maximize leaf exposure to sunlight. Easy ways to identify plants are by their leaves, buds, twigs, bark and habit, or tree shape. As budding botanists, not only can we now recognize the plants that grow on our campus and South Eleuthera by their leaf-shapes and distinct coloring, we now also know about their diverse purposes and advantages in our community. Fermented moringa becomes a natural liquid fertilizer. One unique and valuable plants on campus is called moringa, or the drumstick tree, a specimen touted as the next superfood. The health benefits of the edible leaves and flowers include high doses of vitamin A, B, C, iron, calcium, and phosphorus. The most interesting aspect of our fieldwork this week was creating our own moringa fertilizer to use in our nutrient deficient soils. To do this, we began by stripping the leaves from the moringa branches and scraping them into a bucket of water. Once the bucket was full, we mashed all the leaves into a green paste which we allowed to ferment so as to later became a liquid fertilizer. In the weeks ahead, we will use this batch of fertilizer as a natural, inexpensive, and locally-sourced soil amendment for the seeds we planted earlier in the term. At the Center for Sustainable Development we use organic biochar to help our soil produce the best vegetation possible. Biochar is a stable carbon-rich product of pyrolysis (the thermal decomposition of organic matter in a high heat, low oxygen environment). Many organic substances can be used to make biochar including dried coconut husks, wood scraps and bones from food waste. Here on Eleuthera we use the bark of casuarina trees, as it is an invasive tree to The Bahamas and there is a heavy supply of it. Decrease the amount of water that plants need and in the amount of stress brought on by drought by increasing the capacity of the soil to store water and water-soluble nutrients. The stable carbon matrix holds onto water and air. Improvement of biodiversity of the surrounding soil by providing refuge to beneficial microorganisms that can lead to improving nutrient and moisture uptake by plant roots. The process of making biochar is carbon negative as it permanently removes the greenhouse gas, carbon dioxide, from the atmosphere. Biochar is extremely porous increasing the available air in the soil. Organic chemicals are stored with the carbon matrix during pyrolysis. These organic chemicals stimulate the plant’s internal immune system increasing resistance to pathogens. Turn the water hose on and soak the foliage and ground around and beneath the kiln thoroughly to prevent surrounding organic matter from catching fire. Fully load the kiln with dry kindling. Start the fire at the top and watch it burn its way down. Once a large enough fire has started inside the kiln, one needs to keep loading wood. The loading rate can be determined by the amounts of smoke and ash forming. Too much smoke means too much wood is being loaded too quickly. Too much ash forming means to little wood is being loaded too slowly. Load wood and charring when ash can be seen. Keep doing this until the kiln is almost full. Once the kiln is almost full and the process is complete, drench the charred material with water and cover with soil. Let this sit overnight and unload in the morning. The pyrolysis process is complete after sitting overnight. Last week, the Permaculture research group began to explain their research and findings in and out of the classroom. To recap, this semester we are on a quest to understand the food systems at play on Eleuthera, throughout the Bahamian archipelago, and worldwide. This week, the Permaculture team focused on soil amendments, or additives that help soil to become more productive. Generally speaking, the soils on Eleuthera and throughout The Bahamas are rated as “agriculturally poor” and devoid of many nutrients. These limitations, coupled with a dearth of open spaces (less than 5% of all land in The Bahamas is arable), make farming extremely challenging. Interestingly enough, central and northern Eleuthera is home to a more nutrient-rich and oxidized soil (a.k.a. Bahamian red soil) that originates from West African nations. South Eleuthera, where we are growing our vegetables has very poor soil mainly due to the massive amounts of limestone found on the Cape. In the classroom this week, the team learned about the soil texture triangle as well as the criteria and demands necessary for producing crops on marginal lands. Time in the field was spent investigating and practicing some methods that can successfully increase the structure, value, and mineral composition of the soil. 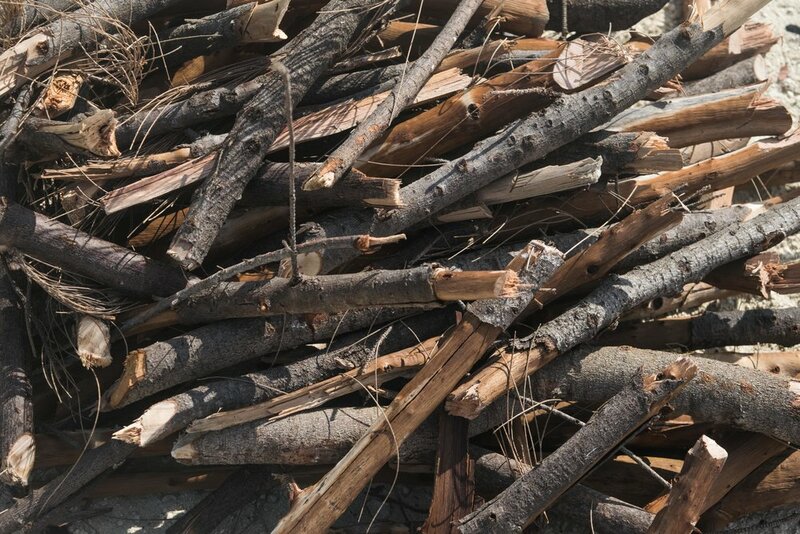 For example, bio-char is the thermal decomposition of organic material in a high-heat, low oxygen environment, resulting in charcoal that then serves as a long-term house for nutrients in the soil. Anything from tree bark to coconut husks can be used to create bio-char. Solar energy has been a leading project of the Center for Sustainable Development since the organization was founded in 2014. We felt it necessary to explore alternative energy sources in The Bahamas because the country relies heavily on fossil fuels, accounting for 99% of its energy needs and our commitment to sustainable solutions. The majority of power in Eleuthera is produced by diesel-generated power plants. Here in The Bahamas, sun is no problem which is why we are committed to taking advantage of everything solar energy has to offer. There are a total of 305 photovoltaic (PV) solar electric modules here on our campus in Eleuthera, however they are not all the same. There are different types of solar modules we use for specific and unique objectives in order to make our community function smoothly. 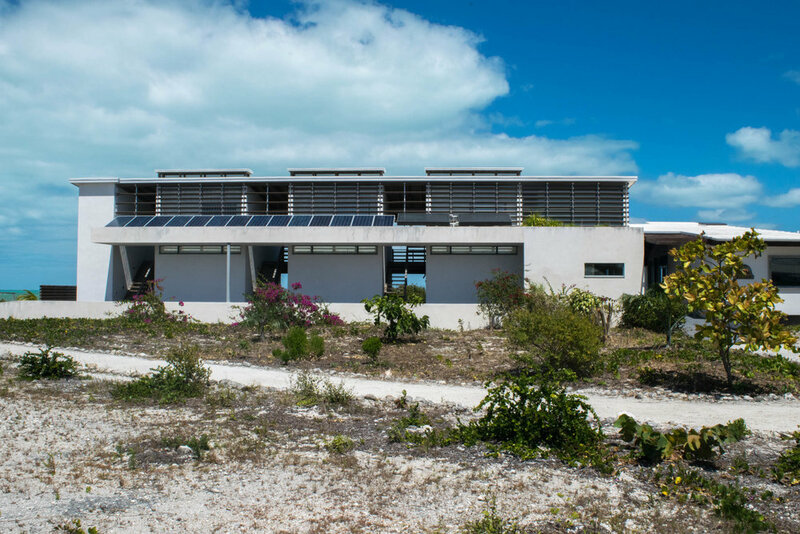 Our largest collection (array) of solar modules on campus resides at the Cape Eleuthera Institute’s Wetlab. The bifacial PV modules have glass on both sides and therefore have two surfaces which are capable of producing direct current electricity. Our bifacial solar modules are comprised of 90 cells (the squares on the grid) and are capable of boosting production by up to 20% compared to a traditional solar module. These are the most popular solar modules that you may see on a house or building while walking around our campus. We have these types of modules on our buildings all around campus. It is important to have solar modules facing south since the sun moves East to West, allowing them to absorb as much energy as possible. These modules do not always have to be on a roof; we have several that are ground-mounted on poles. The Solar Therm Collector modules are the two to the far right on the lower roof. Solar thermal collectors heat our water, and are our only source of hot water in our offices and residences! The collectors absorb heat from the sun and water runs through them as we use a faucet or shower head. These collectors also decrease the use of grid electricity because it uses a cost-free passive heating source to heat water, instead of fossil-fuel electric hot water heaters. With CampIS Cloud software, CSD measures all of our community’s energy consumption and production, which includes our renewable energy production systems. There are numerous benefits to using solar energy. 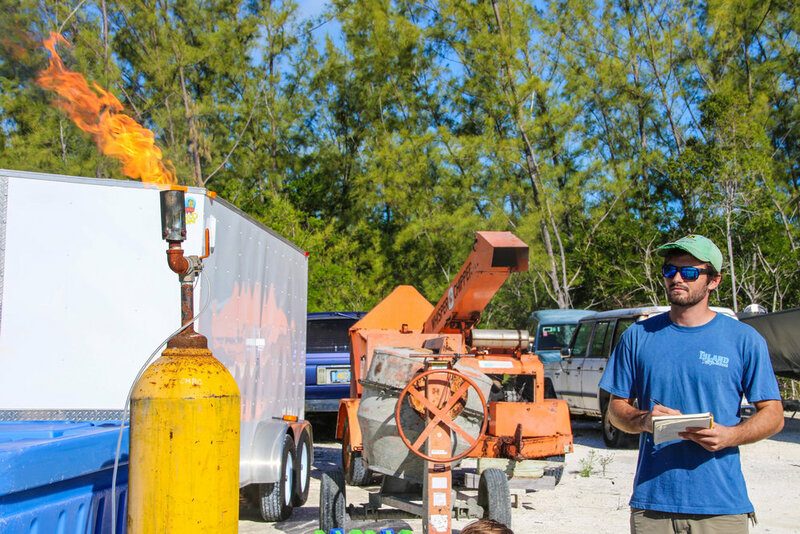 A solar-generated system produces clean energy meaning that it is not polluting the environment, unlike many less environmentally friendly systems, such as diesel generation on Eleuthera. Additionally, solar systems will save money on electricity bills because the consumer will be producing their own energy. Energy demand in not only The Bahamas, but Small Island Developing States (SIDS) as a whole is quickly increasing as as a result, CSD is hoping to expand solar in local communities. CSD is incredibly excited to share one of our latest solar-related projects in which we worked with Island School students to install solar air-conditioning units on our partner organization of the Deep Creek Middle School. Installing a solar system is more than just setting up the modules; there are many factors that must be taken into account. It is essential to consider your energy demand, the available sunlight hours, the orientation of the building and the pitch of the roof. Permaculture Research Team: How do we feed ourselves? This spring semester, there’s a lot growing on at the Center for Sustainable Development (CSD). One of the four CSD-based Applied Scientific Research classes through The Island School semester program is centered around food insecurity and permaculture, a form of sustainable agriculture that attempts to mimic natural ecological systems. The Permaculture Research class is co-advised by Joe Plant and Leigh Schmitt, and their work is an ongoing project now in its third semester. In previous semesters, Joe, Leigh, and their teams of Island School student colleagues completed a comprehensive food audit of the dining hall and conducted a detailed sector analysis of potential growing spaces and the aquaponics system on campus. Now, their research is geared towards planning, designing, growing food, and laying the foundation for an edible campus landscape. The seven enthusiastic, budding farm-to-food Island School research colleagues this semester are as follows: Susanna Cabot, Isabel Cullen, Maeve Goodrich, Kelvin Monje, Kate Pausic, Ezra Stern, and Nora Verdier. The team begins the process of turning over soil on the garden roof of the Early Learning Center. The Permaculture Research cohort is wrestling with many place-based food system-related ideas this spring semester. Specifically, the team is applying logic, reasoning, field time, and sweat to these guiding or essential questions: How can we feed ourselves? What are the true costs (economic, social, and environmental) to successfully growing food on campus? For the long-term, what are the best and most logical uses of our open spaces? And what is the best way to communicate scientific ideas - and our message regarding food security - in the 21st century? The Research team plants seeds to then be transplanted into the new grow beds in the farm. Teamwork makes the dream work! Students aerate the soil to prepare the new grow beds. In sum, seeds and ideas about increased food security were planted this week in the Permaculture Research project. Please stay tuned for more news from the farm in the weeks and months ahead. In our last blog we talked all about why we raise and harvest tilapia here at the Center for Sustainable Development. This week we are giving you the steps on how to fillet your own tilapia. You can use this filleting method for other fish as well including groupers and snappers. Step #1: Clean whole fish with water and place the whole fish flat on a cutting board or table (for freshwater fish clean with freshwater and for saltwater fish clean with saltwater because otherwise it will ruin the flesh). *Note: You can cut the head off either before or after fillet process since the head is great for making delicious broth. Step #2: Use your fingers to find the soft spot between the fish’s skull and where the dorsal spines starts. Step #3: Using the blade of the knife, make a slightly diagonal cut from the soft spot to about an inch behind the pectoral fin . Step #4: Turn fish 180 degrees for a better grip. Then, using just the tip of the knife, make a cut about half an inch deep from the soft spot between the spines and skull towards where the dorsal spines end (cutting as close to the dorsal spines as possible). Step #5: From where the first two cuts intersect lift up the corner of the fillet and begin separating the flesh from the bones, leaving minimal flesh on the bone. Make sure blade is right up against the ribs to cut off as much as the fillet as possible. Step #6: Once you reach the posterior end of the pectoral fin, begin making a cut towards the caudal fin. The ribs on the fish should be visible. DO NOT cut off as it will make separating the fillet from the skin very difficult. Step #7: The fillet is now separated from the bones. Flip the fillet out and begin cutting where the skin meets the flesh. Step #9: Repeat on the other side of the tilapia. The tilapia fillet should be about 20-30% of the entire fish. Now you can enjoy a delicious fish dinner. Happy filleting! Our aquaponics system is a huge part of the many things we do around here at the Center for Sustainable Development (CSD). Aquaponics helps us produce our own food quickly and, of course, sustainably by using the nutrient-rich waste produced by tilapia fish to fertilize all of the growing vegetation. Any fresh water fish can be used for an aquaponics system, even goldfish! We use tilapia because they are extremely resilient. Although we keep our water system very clean, tilapia can survive in low dissolved oxygen levels, poor water quality and within a water temperature range of 10-15° C. Aquaponics helps us significantly offset our campus food mileage. With one system, two high-valuable co-products are produced; tilapia and leafy greens are delivered fresh to the dining hall for campus to enjoy. Another benefit of raising tilapia is that the fish themselves function as a sustainable, valuable, and healthy protein source in our dining hall. A lot less water is used to raise tilapia than is used to raise farm animals, making tilapia a more viable food option than, for example, beef. Additionally, tilapia is rich with nutrients including selenium, vitamin B-12 and Omega-3. Currently, we have four tanks to raise our tilapia in staggered production, not including the tanks used for fingerlings (the young tilapia). Once the tilapia are mature, we harvest them for a meal. We harvest tilapia about every 6 weeks, but as we continue to explore the best way to maximise efficiency in our current system, we hope to have tilapia once a week (to feed about 150 people) on our campus menu. Ultimately, we hope to expand our system to be able to produce enough tilapia to provide two meals per week. As we experiment with adding Giant Freshwater Shrimp to our aquaponics system, we introduce the possibility of producing a third protein-rich meal per week. At our most recent tilapia harvesting we had over 70 tilapia to fillet; luckily for Team CSD, our extended Cape Eleuthera Island School family came to help out! Here at the Center for Sustainable Development (CSD), we have been working hard to find the best formula for natural nutritious fertilizer that we can make ourselves. We have a passion for decreasing our community’s waste, and have found the following everyday waste products to make exceptional fertilizer for our gardens and our farm. We have come up with a few ways to make biofertilizer which is an effective, non-polluting and non toxic organic fertilizer. The use of biofertilizer has been shown to improve germination rates, resistance and yield of production crops. Additionally, biofertilizer improves the soil texture and moisture retention of soils. Below, find three different methods for making your own biofertilizer at home. Rice and potatoes may not be the first foods you would think work for making effective fertilizer, but the water you use to wash and cook them work extremely well because they can create lactic acid bacteria, which significantly improves soil health by decomposing any organic matter and reducing any chance of unwanted pathogens associated with decaying material. It will also remove foul odours associated with composting and manure. This starchy water will allow the growth of indigenous bacteria and milk will be used to isolate the desired bacteria needed for the best fertilizer possible while the unwanted bacteria will die off. Make sure to strain all biofertilizers before use. Clean and sterilize every glass jar thoroughly with isopropyl alcohol or vinegar. Rinse rice in water for 5 minutes or boil potatoes. Fill a glass jar 2/3 with water from either starch and cover with a cotton cloth and elastic band. The cotton cloth allows for air exchange. Place jar outside under a box. The box stops UV sunlight rays from killing the bacteria growing in the water. Let sit for two days. Take fermented rice or potato wash water and fill 1/10 of new glass jar. Fill the remaining 9/10 of the glass jar with milk. Cover with cotton cloth to allow for air exchange. Place on a shelf with no direct sunlight. Let sit for 5-7 days. Separate liquid from curds. This liquid is called Lactobacillus. Store LAB serum in glass jars with lids tightened. LAB has a 6 month shelf life. Dilute 1 tablespoon LAB serum with 1 gallon of water and apply to soil/compost and plants generously. Apply as needed. Members of Team CSD collecting seaweed. The best materials for natural fertilizer can be found in nature itself. Seaweed, leaves, weeds, fruits, vegetables and manure or any other organic material are great for making biofertilizer because they contain macro- and micronutrients, growth-regulating hormones and living beneficial microorganisms. Make sure to keep each type of organic material separate when making biofertilizer however, it is okay to mix the final liquid products together. Collect organic material (e.g. Seaweed, freshly picked leaves, fruits, vegetables and manure). Rinse organic material with fresh water to clean off any debris. Fill a plastic bucket with cleaned organic material. Fill the plastic bucket containing clean organic material with fresh water. Place the lid on the plastic bucket containing organic material and water. Let the contents in the plastic bucket anaerobically ferment (without aerating or mixing) for 4 weeks or longer. Once anaerobic fermentation process is complete, separate the remaining organic material from the nutrient-rich water. Store the nutrient rich water in an airtight jar. One can continue steps 4 through 7 with remaining organic material or acquire new organic material. Dilute nutrient rich water 1 tablespoon with 1 gallon of water and apply to soil generously or spray on plants generously. Apply as needed. The chickens we raise on our farm produce over 10,000 eggs a year, and we import even more eggs and meat to satisfy the breakfast, lunch and dinner needs of our students, staff and faculty. We end up with a lot of leftover eggshells and bones! Instead of just throwing these eggshells and bones away, we have found that they are the perfect tools to create healthy and nutritious fertilizer. These leftovers have been shown to improve vegetative growth, increase in fruit size while preventing environmental stress and fruit drop. Here at CSD, we have seen that these products enable the plant to access more water and nutrients needed before and during the reproductive life cycle. Adding vinegar to the eggshells/bones will result in bubbles for up to 48 hours. Collect dried eggshells and/or bones and dry them out for as long as possible in the sun or solar kiln before use. Crush eggshells and/or bones with a mallet and fill a clean glass jar ⅔ full with them. Fill the glass jar containing crushed eggshells and/or bones with vinegar and loosely place the lid on top. There will be a reaction - bubbles will rise to the surface (If the glass jar lid is closed tightly the gas build up will break the glass). Allow the reaction to finish (approximately 24-48 hours) before tightening the glass jar lids for storage. Dilute 1 tablespoon nutrient rich vinegar with 1 gallon of water and apply to soil/compost and plants generously. Apply as needed. To get the best results, use all three of the above biofertilizers. We have found that the combination of 1 tablespoon (strained - no solids) of each biofertilizer with 1 gallon of water is the perfect recipe for healthy and nutritious vegetation. Following CSD’s recent study evaluating the effects of coconut husk biochar and biofertilizer on the germination and growth of cover crops, the team is excited to announce a collaboration with CoolPlanet™ and ExploGrow™ in the team’s upcoming experimental study beginning this spring. CoolPlanet™ is an American founded company who produces engineered biocarbon technology for use in livestock, agriculture and fuels. ExploGrow™ is a South African company that produces and sells a biological fertilizer containing a blend of beneficial soil microbes. The CSD sustainable agriculture research team will be evaluating the effects of different compositions of biochar (CoolTerra™, in situ made coconut husk, and invasive tree species Casuarina) inoculated with seaweed liquid extract biofertilizer and ExploGrow™ biological fertilizer on the germination and growth of tomato seedlings, a common production crop. The team hopes to broaden their research evaluating organic soil amendments and the growth of healthy production crops to further the Center for Sustainable Development’s initiative of an edible and educational campus promoting the concept of living better in a place. Collaborating study on the horizon between the Center for Sustainable Development, CoolPlanet™ and ExploGrow™. The sustainable agriculture research team has wrapped up the experimental trials evaluating coconut husk biochar inoculated with seaweed liquid extract biofertilizer on the growth and development of cover crops (Photo 2). As the team continues to analyze data, early analyses indicate certain cover crops (e.g. Cowpea, Vigna Unguiculata) prefer sandy soils with no additional nutritional or soil amendments. Although contrary to the teams’ expectations, this preliminary result has positive economic benefits for local farmers and agriculturalists in tropical regions dealing with nutrient poor sandy soil characteristics. Positive economic benefits are also noticed surrounding the application rate of seaweed liquid extract biofertilizer, with preliminary results indicating increased growth of plants at low concentrations. The team continues to compile and analyze extensive data sets and will provide an update in the following months on the final results of the study. Experimental growth of Cowpea (Vigna Unguiculata) in various concentration of coconut husk biochar inoculated with seaweed liquid extract biofertilizer. The study provided insight into the biology of our Bahamian soils and with this knowledge the permaculture and farm team has been planting cover crop mixes including Cowpea within the orchard, chicken pen and open beds around the Cape Eleuthera Island School with great success (Photo 3). The cover crops require no nutrient additions or maintenance and offer an additional food source to the chicken colony while restoring the natural health of surrounding soils. 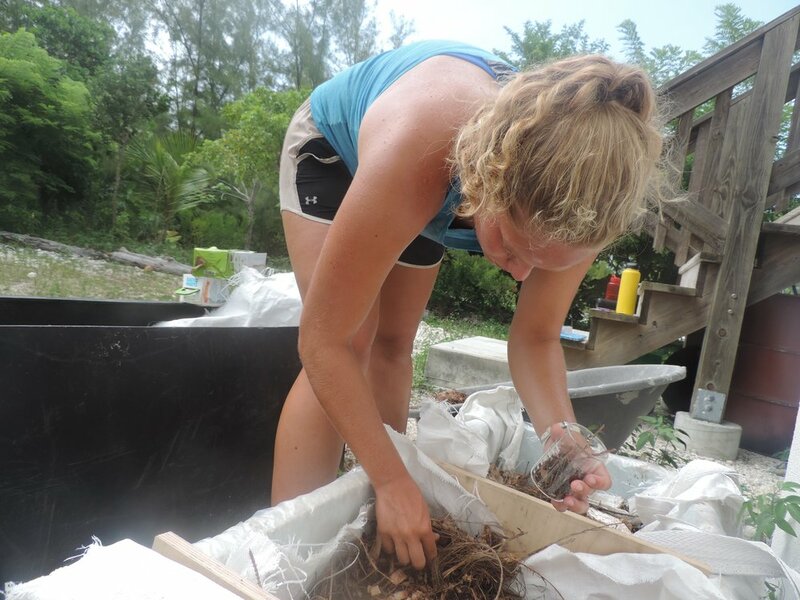 Furthermore, the research team and the Fall 2017 Island School students collaborated with Pineapple Fields Condo Resort and Hotel in Governors Harbour, Eleuthera, and the addition of coconut husk biochar and seaweed liquid extract biofertilizer had positive effects on Cowpea growth in an un-manipulated field environment (Photo 4). The Center for Sustainable Development is very excited to implement the knowledge gained from conducting this scientific study. Free-range chickens amongst planted cover crop (e.g. Cowpea, Vigna Unguiculata) within the CSD orchard. Fall 2017 Island School research field work at Pineapple Fields Condo Resort and Hotel, implementing coconut husk biochar inoculated with seaweed liquid extract and Cowpea (Vigna Unguiculata) seedlings.